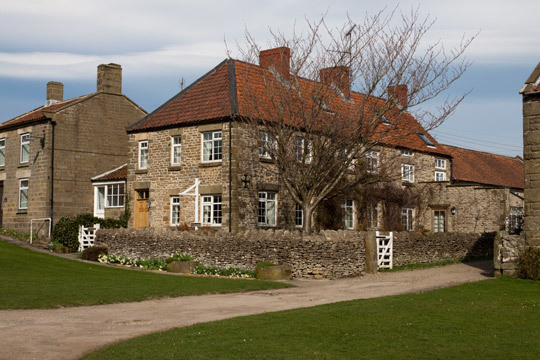 Rectory Farm is an 18th century Yorkshire stone built farmhouse and small holding with horses, sheep and chickens offering stylish bed and breakfast and holiday cottage accommodation situated in the picturesque village of Levisham nr Pickering in the heart of the North York Moors National Park. 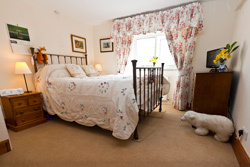 Three bed and breakfast rooms all en-suite, tastefully decorated with extra little touches, fresh flowers, fluffy bathrobes, Egyptian cotton sheets and a spacious guest lounge with roaring log fire. Primrose Cottage - which sleeps four people. 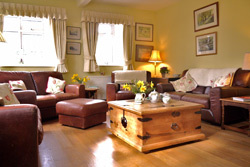 Cowslip Cottage - which sleeps three people. Dogs welcome. They are furnished to a very high standard and situated in a court yard setting with outdoor seating for those summer evenings. 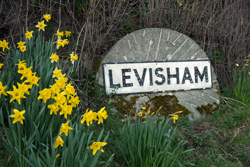 We're recommended by Alastair Sawday's Special Places to Stay. This is an ideal location for walkers and cyclists, with magnificent walks in every direction, and Dalby Forest, 3 miles away, with its numerous cycle tracks and adventure courses. A good village pub, serving food, is a two minute walk from the door, whilst the bustling market town of Pickering, with good restaurants, shops, museums and tea rooms is just 6 miles. Take a ride on the North York Moors Steam Railway, enjoy a day at Castle Howard, or visit Eden Camp Wartime Museum. The area around Levisham has a wealth of things to do at all times of the year, and the Yorkshire Coast towns of Whitby and Scarborough are within very easy reach. There is something for everyone in this wonderful part of Yorkshire.